DICE will pull the sheet from Battlefield 4’s fourth expansion this week. “Dragon’s Teeth!”, we’ll exclaim as they reveal all-new two-handed ballistic shields. Because we certainly didn’t hear about them two months ago. No sir. DICE announced on Friday that we should expect first footage of the DLC pack in the coming week. 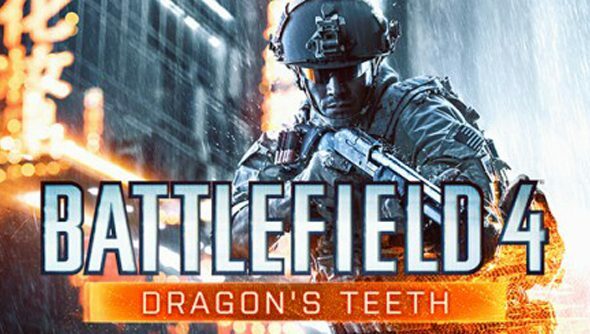 DICE’s new LA studio have put together Dragon’s Teeth, which takes urban warfare as its remit. Its centrepiece shield will be the game’s first official piece of mobile cover, and should adequately replace the bug which built invisible, impassable walls above incapacitated players until just last month. Senior animator Ryan Duffin said at GDC that DICE LA had originally planned to introduce the shield as the counterpart to a sidearm – but were restricted by animation memory constraints on the Xbox 360 and PS3. That’s a shame – most of our PCs wield enough memory to animate Keanu Reeves’ face. But Duffin said at the time that the final, two-handed shield adds a new tactical dimension to Battlefield.